United Cakedom: The Great British Bake Off Series 2- Winner! 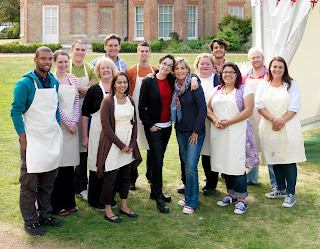 Last night, one of five million viewers, I watched Jo Wheatley win the second series of The Great British Bake Off! The whole series has been a lot of fun! I've watched every week and found it very entertaining. I was pleased when Jo won. I didn't have a favorite as I thought they were all pretty equal when it came to their baking. You can follow Jo on her blog to see what she's up too next and I know Holly and Mary-Anne have blogs too! I think they are replaying it on Saturday mornings and I think you can still see it on the BBC iPlayer site if you've missed it! If you're interested in being a part of the 2012 British Bake off apply now! note: I thought I was the only one who noticed this and thought someone at the BBC had a sense of humor! My husband called me childish when, I astonished, showed him this on the BBC iPlayer. I'm not going to tell you what it is, but follow this link or the one up above! !